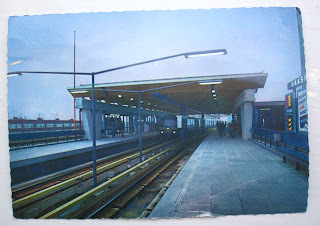 The above postcard was found in a pile of second hand stuff at this years’ Queensday market and it depicts the completion of the Maashaven subway station. The back side euphorically announces: Rotterdam has its own subway! The postcard and the announcement hold a ‘promesse de bonheur’ – coined by Stendhal, indicating how beauty in art holds a ‘promise of happiness’ – a promise which goes for modernist architecture just the same. Thirty years later though the station is worn down, depressing and one of the most dangerous areas in the South district (hitting rock bottom a couple of years ago when a child was killed afterhe threw a snow ball at a car). Now I don’t want to blame the subway line altogether, nonetheless, it’s sad to see how architecture and technology can have tendency to look more at itself than at its surroundings and users. It reminds me of an article I read in the last issue of the Dutch art magazine Metropolis M about the exhibition ‘Shrinking cities’, about the ways in which artists respond to this phenomenon. The article focuses, obviously, on the shrinking cities’ ambassador: Detroit, formerly known as Motown (until the entire car industry went bankrupt). Setting another sad example of the broken dreams and promises of technology, Detroit lost half of its population over the last decades and has an entirely abandoned city center (it is said that some office buildings have trees growing inside them). 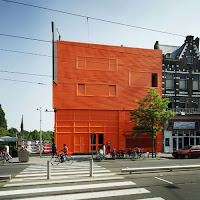 One of the works in the exhibition is the project Object Orange by artists’ collective DDD. 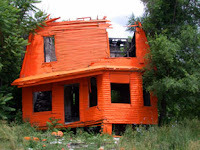 To convince the city to tear down abandoned houses, they painted around twenty of them entirely orange. 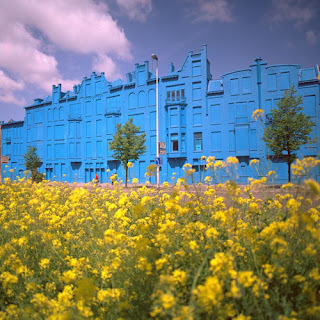 A project which reminds me of the Rotterdam artist Florentijn Hofman who did a similar project in blue, painting an entire housing block (and actually painted night club Nighttown in orange as well during the European championships). They are small, artistic contributions to improvement and hold a ‘promesse de bonheur’ far more realistic than the architecture itself. Nonetheless, the paint merely covers the surface and fails to address the economic and social issues that caused the problems first of all. I’m not nagging! I think it is a serious problem and to emphasise it, I would like to mention the project House, by Rachel Whiteread. It’s one the most famous public art projects and Whiteread won the prestigious Turner Award with it. However, despite its effort to issue economic problems in the neighbourhood, it didn’t receive the same honours in the area. It was severely vandalised and inhabitants of the neighbourhood protested and demanded the art piece to be taken down (a petition signed by 3.500 inhabitants!). A bitter irony, because ultimately there’s a very thin line between the failing of the architecture and the art that criticises it.